I can honestly say...I am having a s*%@ day and I am depressed! I only need to look around my house to know that I am having one of my low days...There are dishes on the bench, I can't even see the other side and my dining table is covered with random stuff. My lounge looks like a tornado has been through it, oh wait - that would be my 11 month old son! On top of the house looking like a disaster, I have to actually (eventually) clean it for Open Home on Sunday, make decorations for the kids birthday parties (doing everything on a very tight budget), get my planning finished for work (unit plan etc) and make time for my blog (I actually take blogging seriously, its more than a hobby to me). With all thats been happening in our lives, I haven't had a chance to just sit down and reflect on Master M's first year or look back at Miss B's ten years - TEN YEARS! Two massive milestones and I have swept them both under the covers...I just don't think I am ready to accept that my babies are growing up! Everything is happening so fast, I feel like I need 6 more months just to catch up! I know that I am going to be an emotional wreck leading up to their birthdays (wait - I already am!) - plus getting the house ready Open Home on Sunday, work on Tuesday, blogging and planning/organising their birthdays (which are happening next weekend) - can you see why I am a little overwhelmed (okay I am VERY overwhelmed), however it's no surprise to anyone that I thrive on pressure and no matter how exhausted I am or will get, I will #makeithappen! I would be really proud of myself if I do manage to pull it off and I will have time to nap after the 12th - by then the house will *hopefully* be sold and the parties are all over rover! These are the MAIN things that I am dealing with at the moment! Clean house and get it ready for Open Home on Sunday - go and visit some Open Homes. Update Master M's baby books and keepsake box. Take a moment or two to reflect on the TEN years of being a MUM!! AAARRGGGHHHHH Where do I begin??? 1. Firstly, accept that there is a problem and whether or not you need to ask for help or if you can help yourself. Write down everything that is bothering you or that is on your mind (kind of like letting it all out...on paper), thinking about what, who, where, why, when? Breaking it down makes it easier to choose a problem, task or area to focus on - it's important to tackle things one at a time. 2. Now that you have chosen ONE task to work on (the other tasks will be done later on), think about ways/solutions that you can get the job done, without becoming overloaded or overwhelmed again. I love lists, so this step is one that I really enjoy! Write a to-do list or put all your ideas on paper, that way you can physically see it and it's one less thing in your (already overloaded) brain! 3. Now to make a plan! Think SMART (Specific, Measurable, Achievable, Realistic/Relevant, Timely) and put it into action! You can do this! Good luck! Once you have tackled the problem/task - give yourself a pat on the back and maybe a treat before moving onto the next problem. If you didn't resolve it, go back to #2 and maybe choose another solution. Now wish me luck, as I am going to tackle my first problem - CLEAN THE HOUSE! I can't concentrate when there is mess or clutter around me (on top of an already cluttered mind)...so I am going to do 15 minute increments of tidying up each area of my home! Oh Charlene!! I so get this. 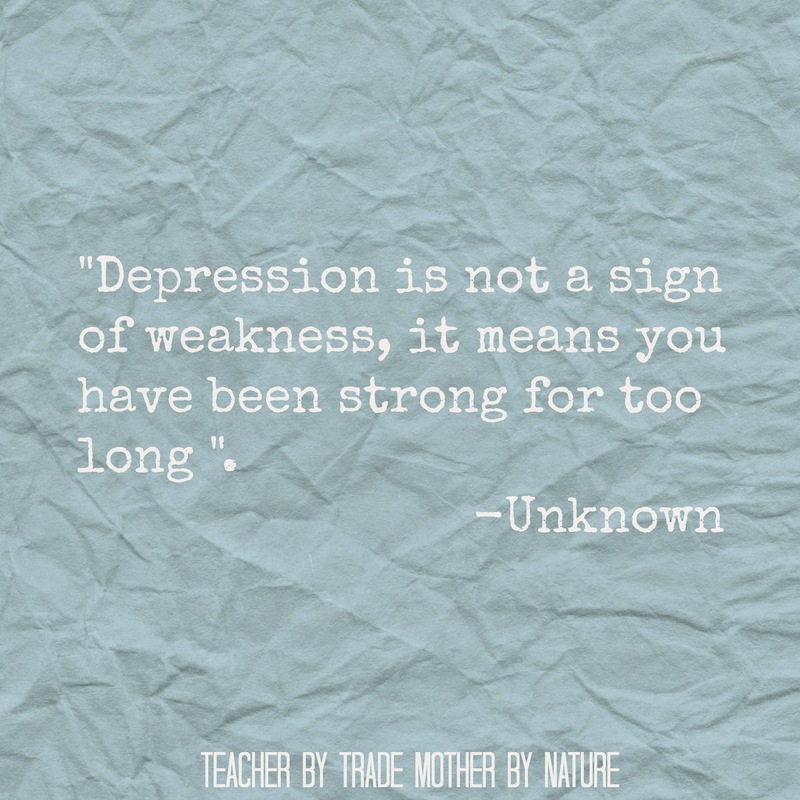 I don't have the depression to cope with, but I am totally overwhelmed most of the time. Just today, all three of my kids were supposed to be at different places at the same time. I had work responsibilities, something I had volunteered for at my daughter's school, and impending snowstorm, and the list goes on and on. I haven't looked at my blog all day until 9:00p tonight. I'm exhausted. I hope things get easier for you soon - although I don't know you in person, I gather from your blog posts that you are a strong woman and a great multi-tasker. I now you'll get through it all! Thank you so much Lisa. I hope you get a good night sleep :) I will be reading the other blog posts in the link up later tonight! I truly don't have depression, but still I can get this completely as I have so much to do weekly here and not enough hours in the day ever. And trust me depression or not, I have my own mini meltdowns every so often, as well. I just thank god that usually my husband is here to pick up the slack if I do need. I hope you are not too stressed and getting what needs to be as you can now. Sending some extra hugs your way!! Awww thank you so much for your kind words Marcia. It means a lot! I am really glad that One Word is continuing and that you and Janine are going to be co-hosting with Lisa! I look forward to our weekly catch ups :). Today is a new day! Wow you have a lot going on right now and everything needs attention and I'm glad to see your a list girl too, I'd be lost without my lists as they help me stay focused on what needs to happen next. I hope you get everything you need done for the open house and that your house will find a new owner. thanks CJ - I have lists for my lists at the moment! I just need to get through the next two weeks and I will be OKAY! Thanks for your lovely comment. Sometimes you just have to share the bad & the ugly - it's not all sunshine and lollipops. So true! Thanks for commenting Lydia! :) Thank you Sonia! You're words of encouragement mean a lot!! It's always good to have a plan. I like to eat the frog first, and start with the thing I like/want to do the least which makes everything after much more enjoyable! Good luck with the open house and hope the birthdays are full of happy! Thanks for linking up with the Ultimate Rabbit Hole! Thank you so much for commenting Sammie! Plans are definitely good to have! The quote at the beginning of your post is one to hold onto. Love it. Happy to see how this post panned out. Filling the hole that we often dig ourselves is so important and cutting the overwhelm down to size is perfect. Hope your week has kept on getting better. I love starting with a clean house. I instantly feel better. It is just finding the time. Thank you for reading my post and commenting Karin - Great to have you here.